Notes: The Twenty Incher originated in Colorado by a local tier on the Roaring Fork River. It is a pattern for stonefly nymphs but also is a good attractor nymph. 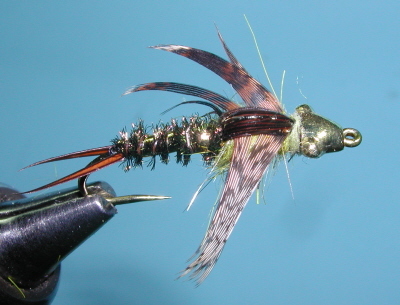 It has been around for at least 20 years, probably earlier when other peacock herl body flies such as the Zug Bug and the Prince Nymph became popular. It remains an excellent stonefly pattern within the Sierra, particularly the Skwala hatch in sizes 8 and 10. 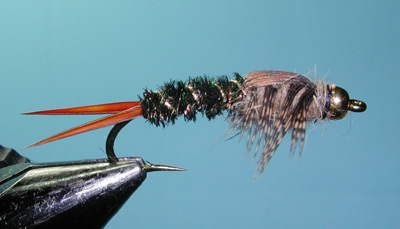 Smaller sizes can be tied to imitate mayfly nymphs. 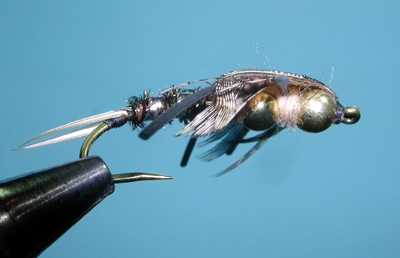 When tying the larger sizes, try using a dubbed underbody with a tapered shape. This will help to get the proper size and shape when using the herl overbody. A TMC 200R gives a nice curved look to the fly. 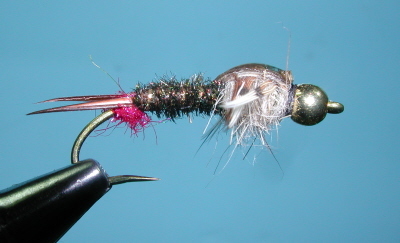 Beadheads are very popular with this pattern in assisting the fly to get to the bottom. A new type of bead called Evolution Nymphhead has a tungsten bead that is shaped like a stonefly head and comes in three sizes and colors. I am also using Turkey Biots for the tail, you could use Goose biots which are stiffer and more durable. The Turkey biots give this pattern nice movement. The original wingcase was a Turkey Quill segment, however, many today use Pheasant Tail fibers. Some will apply a thick fly finish to the casing for added durability. The ribbing can be Gold or Silver Wire. Some will use oval tinsel or flashabou. Fish this pattern within the rocky bottoms of runs and riffles but where the current is not too strong so that the trout can examine the fly. It is realistic enough to fool a selective trout. In streams or rivers, this pattern can be presented in a number of ways the most successful being a cast up stream like a dry fly and then allowing it to dead drift drag free, keep in contact with your line. Alternatively, allow the nymph to sink slowly to the bottom just above the vegetation it often seeks and slowly raise the line on the drift, through the water table to attract attention. A slight variation on this is to actually tighten up the line or pull the line as your nymph approaches the lie of a fish you are sight fishing, this will imitate the natural movement of the nymph through the water table.